Four years ago today, we arrived home with our daughter EJ (the cute, smiley baby sitting next to her proud big bro). Every year since, on November 1st, we have our family day. It is a day to honor our awesome girl and to celebrate what a special and amazing family we have...our forever family (I am such a lucky Momma)! This year we will not be together on family day, so we were planning an evening out for last night. Unfortunately, EJ has been pretty sick the past few days and so we had to delay our celebration for later this week. 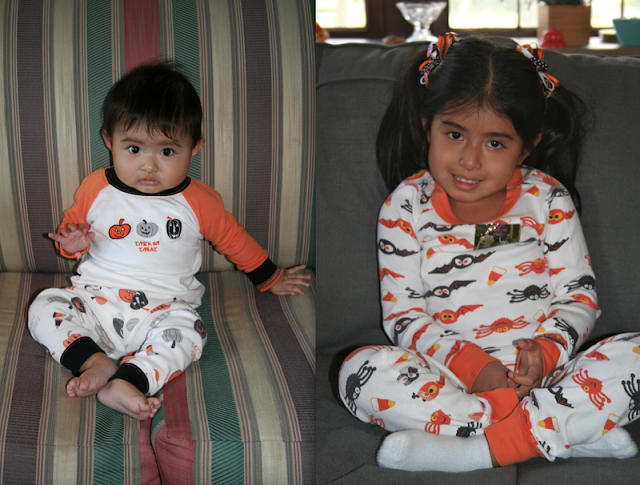 Yesterday, EJ was hanging out on her sick bed on the couch and I realized that I had another pic of her hanging out in Halloween jammies on this same day four years ago. She wasn't thrilled about smiling for a photo, but I am so glad she did. When did she grow up on me? I love this girl to the moon and back! Happy Family Day EJ! Happy Family Day! You are a truly amazing girl who is growing up very quickly. But no matter how old you get, you're never too old for halloween jammies. I love you! Oh goodness - when did they all grow up so much?!?! Look at her, all little. I remember when you used to wheel her to school in the baby stroller and you were pregnant with Olivia. Sigh. Time flies. Happy Family Day!! That (not so) little girl has brought so much joy to many many people! Definitely a reason to celebrate! Oh my goodness! How PRECIOUS was she as a baby?!!! So adorable. What a fabulous reason to celebrate, and what a gorgeous little girl! Wow, can't believe it's 4 years already! Congrats to your entire family. Happy Famiy Day to you all! EJ - what a georgeous smile you have - it could light the world up! And I LOVE the Halloween jams! LOVE the photos. Time needs to start slowing down..so amazing how quickly it is just zooming on by. Hope the sickness has left your house so the celebrations can begin. Happy Family Day to ALL! happy family day ej!! i love you so so much and am so incredibly blessed to know you and love you!